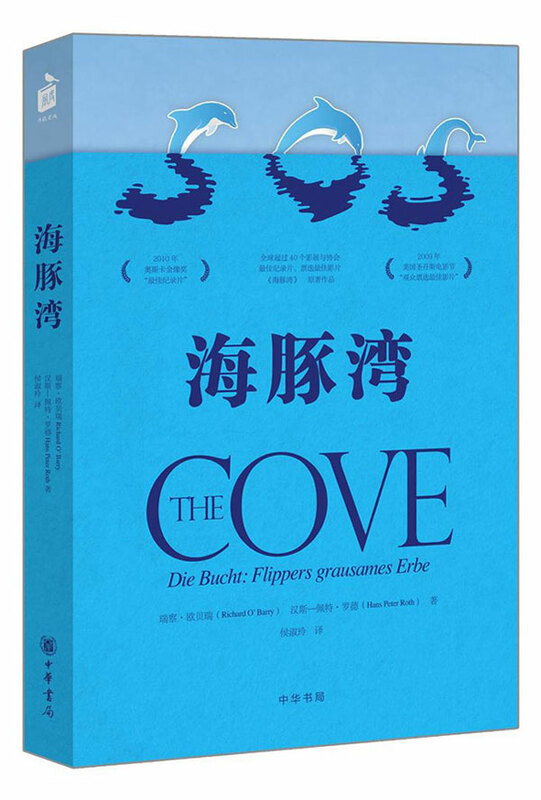 This is the translation of a review published in the ‘Beijing Youth Daily‘ of the new book ‘The Cove’ (Dolphin Bay). 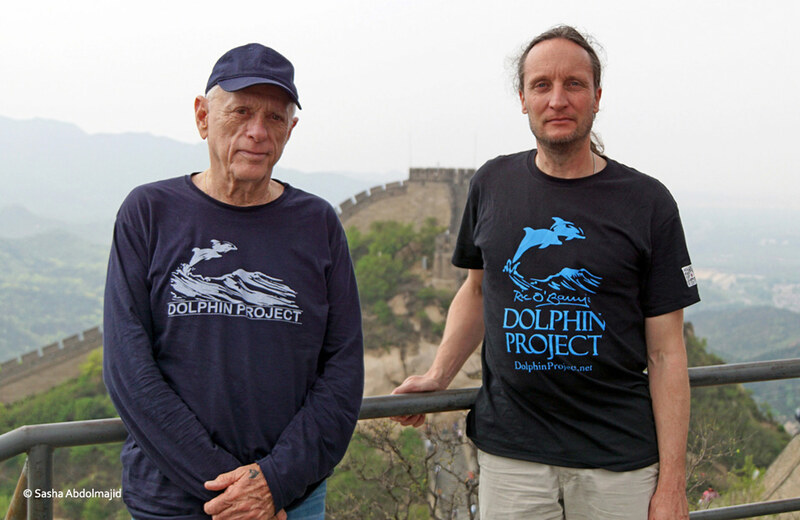 The book was co-written by Ric O’Barry and Hans Peter Roth and launched by them in China last month. O n April 22 this year, the 46th World Earth Day, the screen on the Beijing Book Building multi-purpose hall was playing some shocking images: A few fishermen were dragging some dolphins onto a boat, and a dolphin was leaping for the last time in the blood-red cove… This was immediately followed by the launch of the book The Cove (Dolphin Bay) by ‘Zhonghua Book Company’. The authors of the book, Richard O’Barry and Hans Peter Roth, both attended. The images mentioned previously were taken from the documentary of the same name, which was Richard’s idea and in which he starred. In 2010, the 82nd Academy Awards for Best Documentary was awarded to The Cove. The film recorded some bloody scenes of fishermen killing dolphins in a small town called Taiji in Japan. A few beautiful dolphins would be captured to perform in dolphinariums, many others would be slaughtered for the consumption of their meat. However, the high mercury content in dolphin meat makes it unfit for human consumption. Since they were unable to get permission to make the film, some of the key scenes were taken using a hidden camera in an artificial stone. The book The Cove describes how the adventure of shooting the film began, and about the establishment of the cruel chain surrounding the dolphin captivity industry, as well as Richard O’Barry’s difficult career of protecting dolphins. 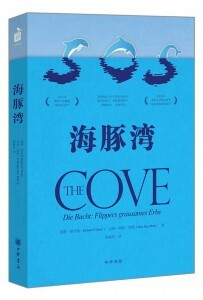 The Simplified Chinese version of The Cove is very meaningful. Because China might just have the golden key which can put an end to the dolphin hunting in Japan. Seventy-five-year-old Richard O’Barry created a strong presence as he spoke up. He left his seat and went to the Reader’s areas. 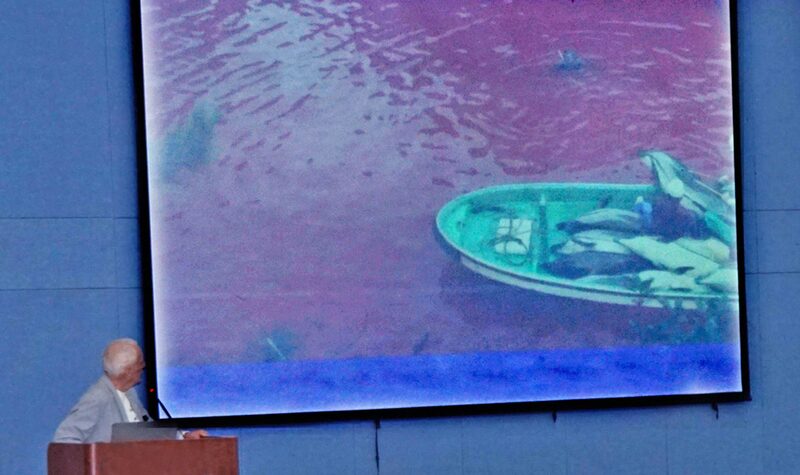 He told the audience that a dead dolphin sold for $500 but an exported living dolphin may sell for $150,000! The major country importing these dolphins from Taiji is China. Many aquariums in the country, including Beijing Zoo Aquarium, which have dolphins swimming and performing in shows, are all from that small blood-red cove. I hope with the publication of this book, more people can contribute to a peaceful way to stop the dolphin imports. Suppose we launched an initiative here who would be willing to sign up? Almost all of the audience raised their hands, Richard smiled with delight. Each year from September 1st to March 31st the following year, the dolphin drive hunting season is carried out in Taiji. Richard and his team protest there every September 1st. The documentary The Cove has meant that Taiji fishermen are blamed by many people all over the world. But the response from Japanese fishermen is that Westerners misinterpret their traditional fishing and food culture. In this regard, Richard O’Barry emphasised on cooperation rather than confrontation. He said, there are only 50 Taiji fishermen killing dolphins, it is not everyone. We need to help them to find a different way to make a living, such as bringing tourists to watch dolphins in the wild. Chinese people do not usually eat dolphin meat. But this book The Cove places a question before us: Would you still buy a ticket to go to an aquarium? Praying for an end to The Killing Cove ! Saw the movie and I sign and share!!! THINKING BLUE COVE FOREVER !!! This barbaric practice has no place in the civilised world. C’mon China, let’s make the world a safer place for ALL species. Extinct IS for ever. Use that golden key for the good of dolphins, Stop the killing!! Any country we can enlist to stop this senseless slaughter is one step closer to seeing it end forever! The world doesn’t need another 6 months of horrendous and needless dolphin slaughter and captures for captivity.